What do the countries South Africa and India have in common? Well… besides ancient trading routes, exotic elephants, cricket enthusiasts and legendary freedom fighters, there is the love of chess. Recently, IM R.B. 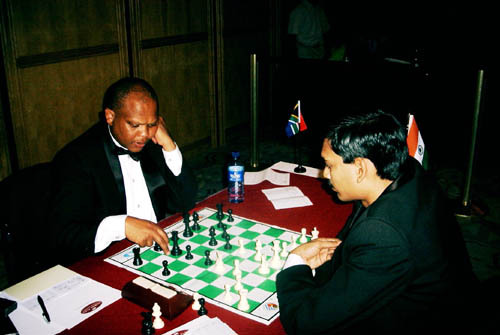 Ramesh of India made the long trek to South Africa to help spread goodwill to the chess community. Ramesh, the current British Champion, made the 10-day trip upon the invitation of The Chess Academy's Jackie Ngubeni. The two met at the World Cup Chess Invitational in India. Ramesh had a busy schedule which included meeting with dignitaries, radio interviews, chess exhibitions and the visitation of numerous schools. Only five days into the trip, Ramesh had visited seven Academy-affiliated schools comprising of almost 10,000 students. Of course, he also "pushed some wood." In a four-game match with IM Watu Kobese, Ramesh came out on top 3-1 in a battle watched with great interest by the South African chess community. "During the match games, the two IMs stunned the spectators with amazing determinations to win over the other that the most repetitive question during analysis was how can they wish to punish one another when they seem so friendly to each other." India has made progressive strides to improve the climate for chess excellence over the past two decades and have succeeded in producing a cadre of young stars. While India is best known for producing super-GM Viswanathan Anand, rising stars such as GM Krishan Saskiran, GM Pentala Harikrishna and the multi-talented girl's champion, GM Koneru Humpy have increased the brilliance of the country's future. With an active federation, India has been host to a number of high-profile tournaments and has secured strong sponsorship from the private sector. Such a combination provides the proper environment for the development of talent and in 10 years, India is poised to become a top five chess-playing nation along with neighboring China. The goodwill exhibited between South Africa and India has opened a new chapter in building transcontinental relations between developing nations and should serve as an example of chess diplomacy. The Republic of South Africa as well as The Chess Drum community would like to personally extend a heartfelt thanks to IM R.B. Ramesh for his contribution to the development of chess on the African continent. Job well done!